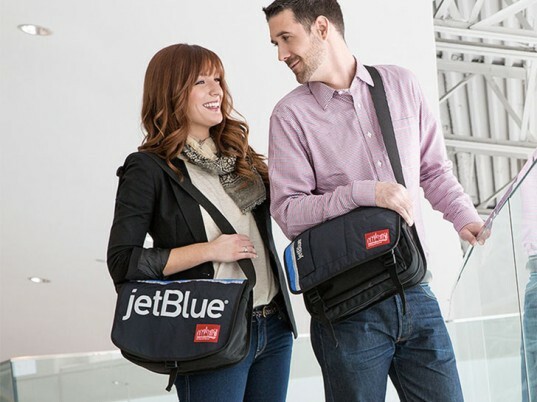 JetBlue is partnering with bag-makers Manhattan Portage to turn decommissioned uniforms into trendy bags. The airliner is taking its its unused flight gear and turning it into a collection of carryalls. “When we launched our new uniforms, it was important to us to keep the fabric from the old and unworn uniforms out of landfills by putting them to good use,” says Sophia Mendelsohn, head of sustainability at JetBlue. JetBlue is partnering with bag-makers Manhattan Portage to turn decommissioned uniforms into trendy bags. The airliner is taking its its unused flight gear and turning it into a collection of carryalls. "When we launched our new uniforms, it was important to us to keep the fabric from the old and unworn uniforms out of landfills by putting them to good use," says Sophia Mendelsohn, head of sustainability at JetBlue.